I got these grapes that are so big Sasha takes bites. For some reason, she doesn't eat the middle. I find this play very impressive, not sure why. Spencer can dig through all of his toys. The weather was finally cool enough to walk the kids over to the park! I love this capture of a conversation with Spencer. The girls (and Tyler's friend) came back for a snack afterward. and showed me how to use it with Spencer. This became a theme of play for both the littles. We attended the DSAT meeting and got a preview of an upcoming play date. Another cool-ish day. I took Sasha outside to blow & pop bubbles. 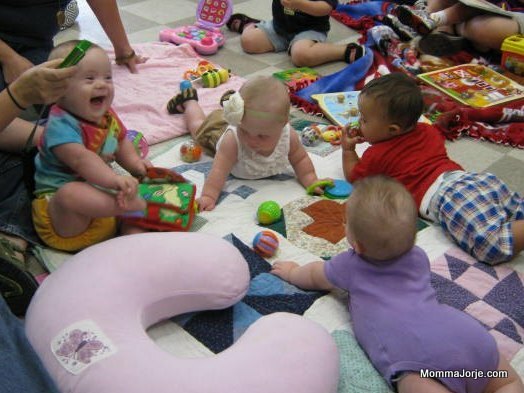 The first Lil Giggles Play Date - a group of children aged 0-4 that have Down syndrome (and their siblings). That is Lily again in the purple. Spencer is having a grand time! Spencer being silly with some latex tubing our CDS gave him for chewing. He loves the stuff. It has a knot inside his mouth. I accidentally guilted my husband into cleaning the entire kitchen. Um... Oops?